BY JOHN SMYTH given at a Heritage Lecture in the House in 2004. The Lecky family first settled in Ireland at Ballylin, Co. Donegal in the early 1600’s when Thomas and Dorothy Lecky arrived there from their birthplace in Stirling, Scotland. They were one of thousands of British families to be settled here as part of the Ulster plantation. Robert Lecky, son of the above named Thomas and Dorothy was born at Ballylin in 1649 and he was to be the first in a long line of Lecky’s to reside and hold the Lecky seat at Ballykealey. Thus began the Lecky dynasty in Ballon – a dynasty that was to continue uninterrupted for over three centuries and spanning some of the most important and turbulent dates and events in Irish history. Pertinently, in a Ballon and indeed wider context the Lecky name represented the face of and the introduction of the much loathed and tyrannical system of landlordism – a system that was to condemn hundreds of locals to a life of misery and penury. It is from this backdrop that we open the doors of Ballykealey house and invite you in to the drawing room where we will examine the Lecky influence and power base at Ballykealey. The above mentioned Robert Lecky married Mary Watson, Crosadit, Cumberland, in 1670. At the height of the Lecky tenure in Ballykealey they owned almost 1,500 acres of the most fertile land surrounding Ballon village. In landlord/gentry terms this would have been considered small as e.g. in nearby Borris McMurragh Kavanagh owned 29,025 acres, The Burtons from Burtons Hall 5,773 acres, The Ducketts from Ducketts Grove 5,336 acres while Henry Bruen had a handy little farm of 24,375 acres at Oak Park. The size of the landed estate usually dictated the physical size of the actual house and this is reflected at Ballykealey when the comparison is made between other ‘big houses’. At the outset it is important to note that in a landlord context the Leckys’ were considered moderate and kind and in particular during the famine their generosity was much appreciated when they ran a soup kitchen in Ballon village and supplied oatmeal where Kavanagh’s pub now stands. Similar to their Watson relations at Altamont the Lecky family drew up plans for and constructed an impressive lake. This was seen as a good will gesture to give much needed employment to the many hard strapped locals and tenant farmers who were impoverished in the run up to and aftermath of the disastrous famine that blighted the country side. This, coupled with their generosity to the locals during the famine is, perhaps symptomatic of and rested easily with the Quaker beliefs as the Lecky family who at that time were members of the Society of Friends – a religion well known for their concern and help of the poor. The following – an extract from “Ordnance Survey Field Name Books” of the county of Carlow, 1839 – is of interest. Baile Ui Chaeluidhe, O’Kealy’s town. Ballykealy ~ ~ ~ J.O’D. This townland is bounded on the North by the townslands of Kilknock and Ardbearn and Torman; South of Ballon parish; West by Ballyveal and Kilnock townlands; and East by Fennagh Parish. It contains 326 acres, 3 roods, 10 perch statue measure, including some rough pasture and some plantation. It is the property of Mr Lecky of Ballykealey House in the parish of Fennagh Detached, and is let in farms of from 10 to 40 acres at 40 shillings per acre, a part being retained by Mr Lecky in his own hands. The cultivated land is good, and there is some excellent grazing, A bye road from Ballon to Carlow passes through the townland, Tullow, 4 miles distant, is the nearest market town. Turf is produced at Garryhill, near Mount Leinster”. The house at Ballykealey was transformed from a large old farmhouse to the magnificent edifice that we know it today in 1830. It was constructed to the design of the eminent Carlow architect Thomas A. Cobden, who also designed Carlow Cathedral as well as the Custom House in Dublin. Five years prior to its completion in 1825 John James Lecky married Sarah Lucia Smith the only daughter of the wealthy John Smith from Balby in Yorkshire. It was he who instigated and insisted that a new palatial home be build for the newly weds and he is also reputed to have partly financed the project. During construction the best tradesmen were availed of and specialists in stucco plaster work were brought from Italy to complete the intricate decorating of ceilings, walls and borders. The superbly ornate marble fireplaces were brought in from Cararra in Italy, an area famous for its marble. Outoffices were constructed around the sides of a cobbled courtyard which was entered by an archway. A short distance away the stables and farmyard were sited. Plantations and woodlands were extensively created at Ballykealy. A Scottish landscaper, namely Gregg, was employed to carry out the design and planting and his expertise is visible and most obvious even to the present day. In keeping with other and neighbouring gentry houses Ballykealey was no different, the one thing they all had in common was their size and magnificence. A feature of Ballykealey being characterised by the wide open landscaped rolling parkland that fronts and mostly surrounds the house. At the front the sweeping lush pastures were grazed by cattle and horses all of which could be viewed from the drawing room in the house which was fenced off using the ingenious method known as the ha ha fence. This fence, consisting of sunken ditches, created the illusion of continuity between the gardens and lawns and the wide open parkland. The lavish, lofty, leisured lifestyle of the landlord class went hand in hand with their status. The big houses were the centre of entertainment. In this regard the Lecky House at Ballykealey played its part and their invitation list would have reflected the elite of the Carlow landed class. A report on one such event was published in The Carlow Sentinel in September 1865 which we include here. You will note the who’s who of Carlow landlord/gentry were present. Shooting and hunting were other sporting persuits enjoyed by successive Leckys. Dinner and tea parties were hosted at Ballykealey at regular intervals and of course these parties would be replicated by their gentry guests at their respective ‘big houses’. 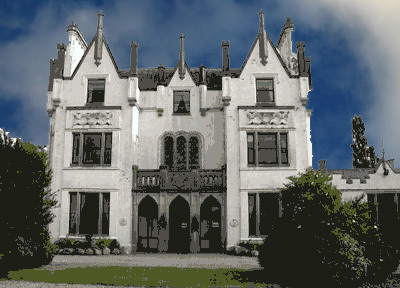 The Lecky’s similar to other landed gentry by reason of their status, wealth, cultural and religious background, social standing and their political power were distanced from the vast majority of locals. Their employees, mostly consisting of a steward, farm workers, grooms, butlers, domestic and other such staff were carefully vetted and chosen and of course had to be subservient to their ‘masters’. Several members of the Lecky family were involved politically and in the judiciary both locally and nationally. John James Lecky, who was born on 2nd October, 1799 was magistrate and deputy lieutenant of County Carlow and he served as High Sheriff in 1828 while John Frederick Lecky, who was born on 25th May, 1826 and who married Frances Margaret Fetherstonhaugh, only daughter of John Breanchamp Brady of Myshall was a Justice of the Peace and Deputy Lieutenant and who was appointed High Sheriff in 1864. Coat of Arms: Az. A chevron set between three roses, argenta (silver/white). Crest: A boars head – raised – P.P.R. The Lecky’s were members of the Kildare Street Club – an elite exclusive club founded in 1780. This club was the meeting place and nerve centre of landlord life in Dublin and membership of which reflected on status, prestige and wealth. The Leckys aligned themselves to Kildare Street Club which was exclusively male and where they would meet and socialise with fellow gentry classes who shared their politics, culture and outlook. In the main the Lecky’s were an old British military family several of whom perished in both world wars, Colonel Beauchamp Lecky, D.S.O. and a member of the Royal horse artillery, second son of John Frederick and Frances died November 15th 1928 aged 70 years after a distinguished British military career. Similarly Capt. John Rupert Frederick Lecky Royal Fusiliers, only son of John Rupert Robert and Florence lecky was killed in action on 28th September, 1915in front of KUT-EL-AMARA MESOPOTAMIA, while attached to the 2nd Norfolk Regiment and he is laid to rest at the village of SAFFA on the banks of the river Tigris, while Molly Rosamand Evelyn Grace, assistant section officer W.A.A.F., wife of Raymond Grace and 3rd daughter of Major General St. Clair Lecky was killed while flying on active service on June 14th 1942 aged 34 years. John Frederick Lecky was very active in local and national politics and in fact he was Secretary and Treasurer of the Carlow branch of the Irish Landowners Convention which was set up to defend landlords in light of the dramatic and sweeping changes brought about by the success of the Land League and the rapidly increasing reality that the old order was disintegrating at an alarming rate. When the Grand Juries – almost exclusive to the landlords were replaced in 1898 by what we now know to be County Councils. Monumental to this transformation and significant in the shift of power from the landlords was the fact that in the first County Council election John Frederick Lecky failed in his attempt to be elected – the seat going instead to Maurice O’Neill – grandfather to the present Maurice O’Neill, Laragh, Ballon. John Lecky, an only son and who had inherited the Ballykealey seat in 1908 was obviously an innovative type as he built an aeroplane in a field that is known to this day as the aeroplane field. He engaged the services of an English engineer but for whatever reason his attempts to fly the plane failed and is thought locally that it crash landed in its maiden attempt to fly. As referred to earlier the Lecky’s were originally Quakers or more correctly members of the Religious Society of Friends and in this context we are indeed very privileged to have made contact with Penny Alston(nee Lecky), who together with her brothers Bryan and Jasper are the last surviving members of the Ballykealey Lecky family. Penny has very kindly written a most enlightening article for the Chronicle which is included below and it gives a wonderful insight into her life and her beliefs. We also include here as expertly and kindly supplied by Penny the entire Lineage of the Lecky family. She also mentions the Old Quaker graveyard on the grounds at Ballykealey and also their own adjacent Lecky private graveyard where most of her ancestors are interred. We reproduce an ordnance drawing of both graveyards as well as other related correspondence. Aside from the graveyards on the lands the R.I.C. barracks was also situated on the Lecky estate and indeed the building still serves the Ballon community well – now as a Garda Station. The land war, the war of independence and of course the Civil War were the catalysts in the gradual erosion of the landlord class in Ireland. In this regard the Lecky family were no different. Economic circumstances greatly militated against them as their power base was crumbling at a rapid rate. The onset of the Irish Free State together with a new and more democratic judicial system completely destroyed whatever remnants of authority once enjoyed by the landed class/gentry as dispensers of justice and thus took away the very fabric around which their power and social prestige was inextricably woven. Thus began the beginning of the end of the Lecky dynasty at Ballykealey. The perception of the landlord or the gentry conjures up images of grandeur, extravagance and opulence on a scale unknown to and unheard of to the locals. This, understandably but unfortunately was the buffer between the two vastly contrasting traditions. However it is widely accepted that the Lecky legacy and their tenure at Ballykealey was for the most part a harmonious and mutually beneficial interaction between “the poor and the gentry”. There appears to have been an appreciation between the Lecky’s and their tenants and indeed an indication of this is seen in a letter to Colonel Robert Lecky from his tenantry dated 28th May, 1921 and signed by nine local tenant farmers and included among them is the name of this writers grandfather. This letter is reproduced elsewhere. Bearing in mind the political, religious, social and cultural backdrop from those times long since past it is remarkable how the influence of a once proud and integral part of Ballon life still provides debate, chat, sometimes hostility, perhaps fondness for a system that was imposed on us and in many ways makes us all what we are today.